When I get legitimate reports of Bluefins pushing an 80-100 lbs. that is when I start targeting them. We started yesterday’s trip inshore at least 20 miles north of where all the recent BFT reports have come from lately. We picked this northern location to avoid the holiday boat traffic but the hills and lumps we fished between the 20-30 fathom had no sand eels on them so I knew it going to be a lost cause so we picked up and ran out to offshore to the 50 fathom line where we caught 20 plus Yellowfins back in early June. After trolling for 2 hours with no signs of life except for Mahi-Mahi we brought in our Yellowfin spread and moved to the Big Eye hole and started our quest for a Devil Tuna. There was probably 20-30 boats all trolling for Big Eyes and with hardly any boat getting any bites even during the prime time after 7:00 pm. We got lucky and did have two bites with one coming tight on a Cherry Jet lure and the other on a red spread bar that dropped the hook bait. We boated our Big Eye and headed home at 9:30 with plenty of meat for our group and some sore arms and backs. Overall most boats never had a bite but not sure what happened after 10:00 pm when we left the canyon and headed home. Basically slow fishing yesterday (Sunday) for Big Eye compared to late last week when the bite was on fire. I have had lots of requests for information on what tackle we use when targeting Big Eyes stand-up. Over half our Big Eyes have been caught on 30 class tackle and just added two more 30’s to our spread. We have never had one take more than 50 minutes to the gaff with a 30 class tackle with almost all the tuna over 200 lbs. We load them with 100 spectra with 100-130 lb. mono top shots and 150 lb. leaders with a 9/0 7691 Mustad Southern style tuna hook. Almost all our Big Eyes have been caught in less than 40 minutes stand-up with normal charter customers. We use as lightest tackle possible that will handle tuna up to 275 lbs. to make it easier for our customers. I feel the secret is top quality Penn and Shimao reels and all our rods are built on CalStar E-glass blanks in the 50-130 and 80-130 lb. rating. Most of our rods have big foot guides to be able to wind the leader right on the reel. The Cal Star rods can put so much pressure on a big tuna especially in low gear and this all comes from testing on the Long Range boat out of San Diego when they fight 300 lb. Yellowfins straight up and down in deep water. Our Big Eye last night took 30 minutes to the harpoon on a 30 class tackle reel. We get all kind of reaction when we put mono top shots of 100 and 130 on 30 reels but that is what works for us for Big Eyes standup. If anyone is interested in one of these combos Bluefin-Big Eye trips contact us and we can discuss this in more detail. 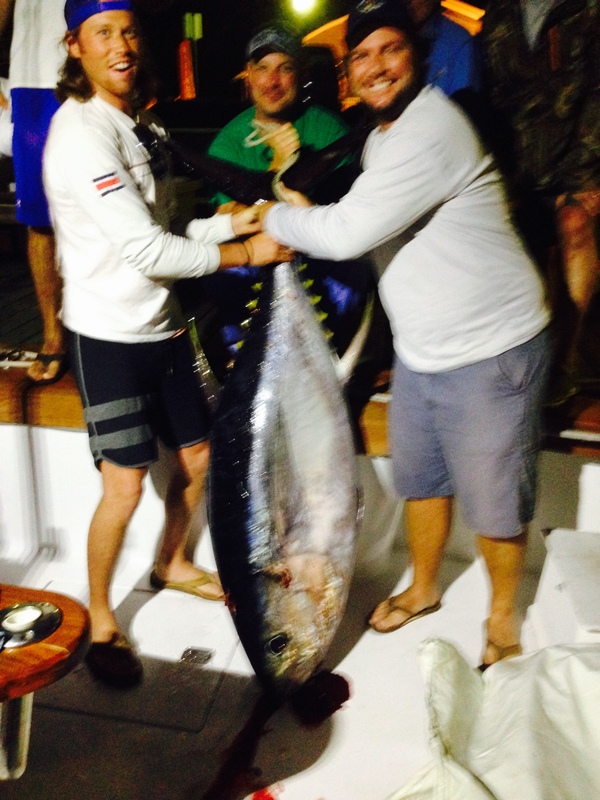 They have the possibility to catch a Bluefin well over a 100 lbs. and a few 200 lb. Big Eye all on the same trip. I expect the Bluefin bite to only get better every day now with the bigger ones showing on many of our 20-30 fathom lumps out of Southern NJ.